In this section admin can manage the privileges. Here we have 2 types of privileges, Snippet Management Privilege and Snippet Usage Privilege. 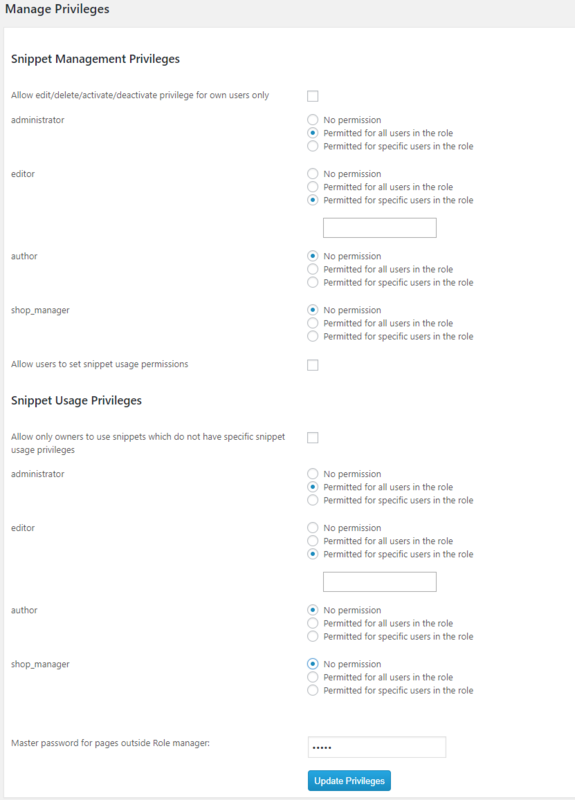 In the privilege section admin can setup who can manage the snippets and who can use the snippet. Also admin can add a master password for the pages outside the role manager. In this section you can provide the permission for managing the snippets like create, edit, delete, activate and deactivate. Allow edit/delete/activate/deactivate privilege for own users only – If we select this option, only the account owner can edit,delete, activate and deactivate the snippet. By default we have the Administrator, editor and author roles and we can set the permission for these roles. If you have more roles, it will also display here and set the privileges. 3. Permitted for specific users in the role. If you select the option “Permitted for specific users in the role”, you can enter the username in the box. Also we can allow these users to set snippet usage permissions. Here we can set the permission of usage of snippets when publishing or editing a post/page. Here we can allow only owners to use the snippet.